Almanzo Wilder: Life Before Laura . . .a T.O.S. Review | My Journeys Through Life . . . Herding Cats In New Mexico! 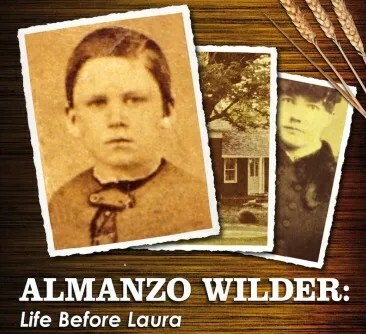 I was really pleased to have the chance to review the DVD Almanzo Wilder: Life Before Laura, as I’ve been a long-time fan of Little House On The Prairie. I am old enough to have watched the television show every week when it was first broadcast, and now my children enjoy watching as well! My children and I are also going through all of the books as read alouds, and we began with Farmer Boy in preparation for this review. This documentary is produced by Dean Butler and Legacy Documentaries, who portrayed Almanzo in the TV series, and has for nearly 30 years had an ongoing association with the series and the Laura Ingalls Wilder community. This DVD documentary runs almost an hour, and is hosted by Dean Butler. Some of my kids were excited that we were going to sit down and watch it, although “The Batman” wanted to forgo this in favor of playing his Nintendo 3-DS. Mom prevailed, and we settled in one afternoon to view Almanzo Wilder: Life Before Laura. It really didn’t take very long before even “The Batman” was enjoying it, because we had, as I said, prepared by reading Farmer Boy. The documentary is filled with re-enactments from the book, and my boys were quick to point them out, talking all throughout the program about each one as it was shown, and what they remembered from the book. Three of my boys are very literal children, and the two younger ones, “Mr. Loquacious” and “The Puzzler” kept asking how come “Laura” didn’t look like Laura. I had to explain several times that this was not the TV show that they watch, but that it was a program telling us about the “real” Almanzo when he was a boy, and (briefly) the “real” Laura, when she first met Almanzo. Being boys who love to eat, they loved all of the descriptions of food in the documentary, as they had loved them in the book. One of the narrators talked about that as well, saying that most likely, a lot of those descriptions were exaggerated by Laura in her writing. She and her family had been poor, while in comparison, Almanzo’s family would have been considered rich by her, most likely. The boys were really interested to see that the incident in Farmer Boy, when the new teacher restored order in the school with a big whip, was also in the documentary. As Dean Butler commented during that portion, it may seem harsh to some readers, but it certainly was a time when young people were held accountable for their actions! My children enjoyed hearing about Almanzo’s growing up years, his longing for a colt of his own, how he spent his days. The descriptions of barn chores and such made them realize they are not as overworked as they sometimes make out to be, LOL! The documentary Almanzo Wilder: Life Before Laura is available for $21.95. My boys and I absolutely recommend this DVD to you! It would be a good addition to home-schoolers studying American History in the mid-1800’s, or doing a unit on Laura Ingalls Wilder. It’s great for learning about how people lived during that time! Beyond that, it’s a good, wholesome, family DVD! I will not hesitate to let my children watch it without me, anytime they like. In this day and age, that’s kind of a rarity, and we have to be careful of what we let them view on their own. I would say that this DVD would be good for any age, beginning with children who are old enough to sit and listen to the book Farmer Boy being read to them. All in all, we really enjoyed this documentary, and now the boys are ready to finish reading the book and move on to reading the rest of the series. I think you will enjoy it, too! To read what other crew members thought, please click below . . . When my eldest (the horse girl) was really into Little House and anything to do with the West, we read Farmer Boy. What I remember more than anything was the constant description of food. He must have been in a growth spurt at that time. All he did was eat.